DSST exams are a fantastic option for teens eager to earn college credit without completing costly coursework in a traditional classroom. Owned and administered by Prometric, a global leader in testing and assessment services, DSST exams are accepted by nearly 2,000 colleges and universities. What’s the Principles of Public Speaking DSST Exam Like? The Principles of Public Speaking DSST exam gives students a chance to earn college credit by demonstrating their understanding and mastery of successful public speaking concepts and techniques. While the American Council on Education’s College Credit Recommendation Service suggests that students should be awarded the equivalent of three semester hours for earning a qualifying score, every institution sets their own requirements. Before taking the exam, it is wise to contact the college or university you hope to attend and ask about their DSST policies. The Principles of Public Speaking DSST exam’s format is a bit different from that of most DSST exams. It features two parts and both parts must be completed successfully to earn credit. In the second part of the Principles of Public Speaking DSST exam, you will be required to craft and deliver an impromptu persuasive speech in 20 minutes. The speech must be three to five minutes in length, and you will be given ten minutes to prepare notes and five minutes to record it. It will be evaluated by a professor of a public speaking course at an accredited university. Improper timing, poor editing, failure to address the topic, and failure to take a single, identifiable position are all reasons for automatic failure of this portion of the exam. There are several things that you can do to prepare for the Principles of Public Speaking DSST exam. A thorough study plan will increase your chances of earning a passing score and college credits. 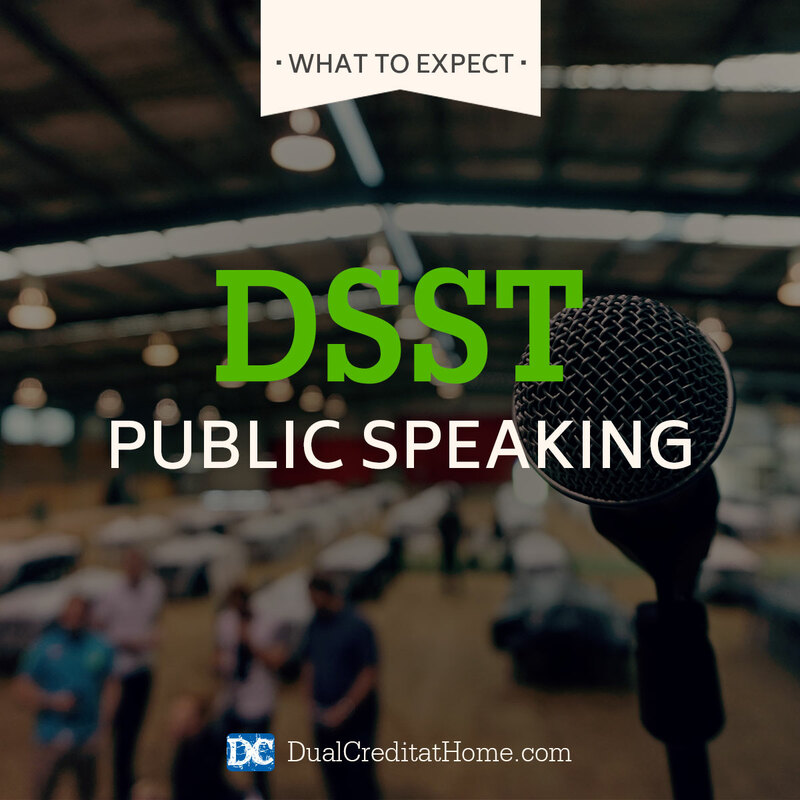 Dual Credit at Home offers a comprehensive Principles of Public Speaking DSST Study Plan. We’ve eliminated all the guesswork of what to study and how to study, so you can successfully pass this exam! Review college-level textbooks on the subject. You might also find it helpful to take the online practice test offered by Petersons. Attend events where others are speaking and analyze their performance. Gain practice and grow more comfortable with public speaking by finding opportunities to speak in front of a group. Some suggestions would be to deliver a “speech” to your own family or to a 4H group of another similar group that you’re a part of. Dual Credit at Home will give you a complete Study Plan package for taking not just the Principles of Public Speaking DSST exam, but 12 more CLEP & DSST exams that can earn you up to 51 college credits. To learn how Dual Credit at Home helps students save time and money on college, download our free e-book, The Dual Credit Secret.